The Great Bond Elevator Analogy. Phil, what the heck are you talking about? I get many questions about why rates go up and down when there are no economic reports or political news to affect trading behavior. So, I came up with an analogy to help explain the same. Keep in mind this is a very rudimentary illustration and explanation. First it’s important to understand that when traders perceive the economy as weak, for example when an economic report shows higher unemployment, then stocks aren’t very appealing and traders would rather invest in safer bonds. Simply put, when traders invest in bonds, a lender’s rates improve. On the other hand, when traders perceive the economy as strong, for example when an economic report shows lower unemployment, then stocks look like a great investment. When that happens traders usually sell off less attractive bonds to buy stocks instead and when bonds are sold off a lender will worsen their rates. At the end of the day, the trader hopes to buy low and sell high. But how do traders decide when to buy or sell bonds when there are no economic reports or political news to persuade them? Well, I’ll tell you…they look for past trends in the buying and selling of bonds to provide insight so they can make an informed guess on which way the market will move. These trends are called moving averages and on a chart are referred to as “Ceilings of Resistance” and “Floors Of Support.” Put another way, the Floors and Ceilings represent past trading behavior, and therefore they provide guidance for traders on whether to buy or sell. A good way to think about how traders analyze Floors and Ceilings is to visualize a glass elevator in a hotel. Bonds are the glass elevator…when traders buy bonds the glass elevator goes up and when they sell off bonds the glass elevator goes down. Got that? Good. Now visualize traders are buying lots and lots of bonds…the bond elevator is going up and passes a Ceiling and then it continues to go up and passes another Ceiling. When it reaches the top traders start selling off bonds and now the bond elevator heads down and passes a Floor and then passes another Floor. Keep that picture in your head. Traders are always keeping their eye on the bond elevator…they watch it from afar…like if you were watching it from across the lobby. From afar, you don’t know whether the bond elevator will go up to the top floor, or just go up one floor before coming back down. But you do know that each time the bond elevator nears a floor, there’s a chance it might slow down and stop. And if it does stop, it might head the opposite direction. Absent economic reports or political news that give insight on whether to buy or sell bonds, a trader looks to see where the Floors and Ceilings are based on past trading trends. As the bond elevator nears a floor or ceiling they prepare to take action…either to buy or sell. Traders put the Floors and Ceilings on a graph and compare the current trading activity for guidance on whether to buy or sell. Remember, because traders always want to buy low and sell high, any insight on how the bond price might change is valuable. As the bond elevator trades up towards a Ceiling, traders wonder if the Ceiling will slow it down and cause it to reverse direction downward…that’s why it’s called a Ceiling Of Resistance. Similarly, as the bond elevator trades down towards a Floor, traders wonder if the Floor will slow it down and cause it to reverse directions upward…that’s why it’s called a Floor Of Support. Here’s an example of what it looks like when traders are buying bonds and the bond elevator is heading up towards a Ceiling. Will it slow down, stop, and reverse directions downward? Absent any economic data or news, a trader may reasonably conclude the bond has reached its high point and sell at the Ceiling to get the highest possible price. If there is some economic report or news that gives traders a reason to keep buying, then the bond elevator may not even slow down and will break through that Ceiling. If that happens, then traders will look for the next Ceiling up for guidance on when to sell. Now imagine traders are selling off bonds and the bond elevator is heading down towards a Floor. Will it slow down, stop, and reverse directions upward? Absent any economic data or news, a trader may reasonably conclude the bond has reached its low point and buy at the Floor to get the lowest possible price. If there is some economic report or news that gives traders a reason to keep selling off bonds, then the bond elevator may keep heading down and break through the Floor. If that happens, then traders will look for the next Floor down for guidance on when to buy. A lender’s Capital Markets Department watches Bonds trade up and down when setting rates and pricing. Simply put, if bonds are being bought and heading up the elevator, then Capital Markets will improve rates/pricing. But if bonds are being sold off and heading down the elevator, then they will worsen rates/pricing. 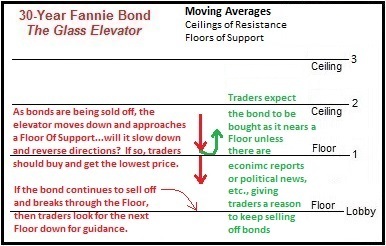 If the bond elevator breaks through a Floor or Ceiling, then they know that trading is exceeding a past trading behavior and therefore they should set pricing for the upside or downside towards the next Ceiling or Floor. Having a working knowledge of how traders analyze the market and consider past trading behavior gives you insight on how a Capital Markets Department sets their rates/pricing. More importantly, this gives you more talking points with your customers. A borrowers’ trust level increases when they perceive you as knowledgeable about the markets, particularly when they ask you for your opinion about the direction of rates, and they ALWAYS ask. The more they trust you the more likely they will do business with you and refer everyone they know to use you as well. I hope all of that makes sense to you…let me know if you have any questions or comments.